CSUN President Dianne F. Harrison (center) was honored by the CAAASA along with Michael Spagna (left), the former dean of the Michael D. Eisner College of Education at CSUN and currently the provost at CSU Dominguez Hills, and Eric Cooper (right), the president at the National Urban Alliance for Effective Education. Photo courtesy of CAAASA. Harrison addressed those gathered for the event and openly thanked CAAASA for its work in championing the efforts of African-American students throughout the state. 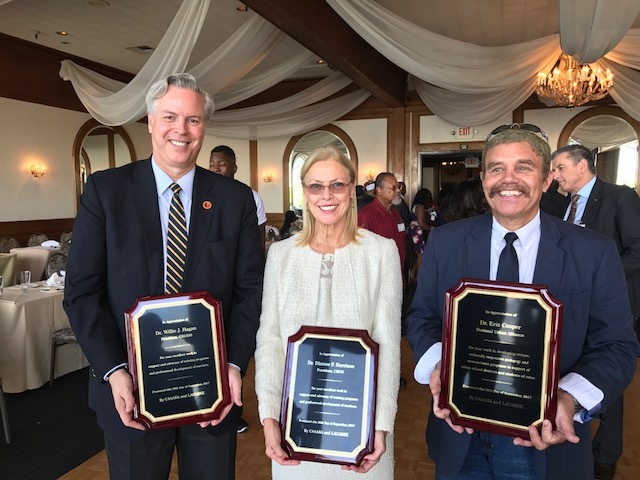 In addition to Harrison, CAASA recognized National Urban Alliance (NUA) for Effective Education President Eric Cooper, Learning Policy Institute President Linda Darling-Hammond and California State University, Dominguez Hills President William Hagan. The efforts of Cooper and the NUA, with whom CSUN has partnered with in the past, are of particular importance to the overall national goal of diminishing the educational gap between white and African-American students by embracing race and culture for all students, including those in other underrepresented groups. The use of these teaching and learning approaches have proven successful in other cities across the country, and are making an impact in California. CSUN has been a leader in ensuring that educators are prepared to help young people of all backgrounds thrive during their K-12 years so that they can be prepared to pursue higher education. Harrison noted the efforts of CSUN faculty, including their work with Project Grad, which develops curriculum change, mentoring and advisement opportunities, providing academic support to promote academic success for African-American and other students. Harrison also pointed out the work on CSUN’s campus and its Matadors Rising campaign, which is promoting efforts to eliminate opportunity gaps and to help CSUN students reach graduation in a timely manner.